Ahhhh, the unhurried play of playing alone with nowhere to be and no one telling you what to do! Solitary play is one of the mainstays of childhood – a magical place created by kids for themselves. It is an essential source of personal power, refreshing self-directed mastery, creative originality and an unfailing path to self-discovery. It is a safe place to come to understand emotions, other people, the science of objects, to problem solve, investigate, hypothesize and experience an uninterrupted sense of self. And yet, one of the biggest complaints from parents is: my child doesn’t know how to play alone! Cue in Amy Poehler and Seth Meyers from SNL saying “Really!?!”. Really…he doesn’t like to be in charge of what he does and how he does it? Really…she needs you to tell her what to do next? Really…he prefers structured activities every day of the week? Really…she’s bored? In early childhood, play is defined as self-directed fun. Kids do it because they like it. If they aren’t liking it, they have the freedom and choice to move on to something else. The issue isn’t whether kids know how to play; it’s whether or not they have the opportunities to play. Kids are just like those adults who need to “learn to relax” the first few days of vacation. They must adjust to being unscheduled and unplugged. The busyness habit has made play seem unnatural. Opportunities for play starts very young, babies having the time and space to explore the sights, sounds and textures of their world. Two things easily interfere with solitary baby play: 1. the overwhelming desire to be with these amazing sources of joy and wonder, and 2.lots of babies hate tummy time. The first one takes a little practice, learning that a few minutes here and there will actually allow you to brush your teeth or grab a cup of coffee. The desire to be present and available 24/7 is great but so is the possibility of burnout. Parenting is marathon that lasts for decades so creating a little breathing room can be helpful for parents and for children. The importance of floor time is monumental – time for babies to stretch and move. They discover with all of their senses starting on a blanket and eventually moving around a room or outside. Unfortunately, tummy time feels unnatural to a generation of babies who sleep on their backs. So initially, parents may need to be on the floor too, smiling face-to-face until baby gets used to new position. Gradually move away until your baby discovers the power and joy of his body and his world. Of course, as soon as babies get comfortable with floor time, a new stage of development unleashes a newfound clinginess. Don’t get discouraged. Separation anxiety arrives around the time of object permanence when your baby’s cognitive ability is skyrocketing. Your baby is becoming a thinker. So, in the same way you helped your baby discover he was really OK on his tummy even though he initially didn’t like it, you can use your voice and peek-a-boo games to gently reassure him that you always come back. Respond but try not to rescue your baby from this very age-appropriate opportunity to learn and grow. Toddler play introduces the new issue of supervision. A baby-proofed room used to keep your child safe. Now she can climb, throw, and open doors. The trick is to set up your child’s independent play area in a place where you can also be busy (cooking, reading, doing laundry, paying bills), but not active in your child’s play. Of course, you can still play with your child other times. Playing together teaches perspective taking, compromise, negotiation and sharing. This, however, is a kind of parallel play, the comfort of feeling another’s person’s presence while doing exactly what you want to be doing. 1. Trust in your child’s ability and resourcefulness by doing less so he can do more. 2. 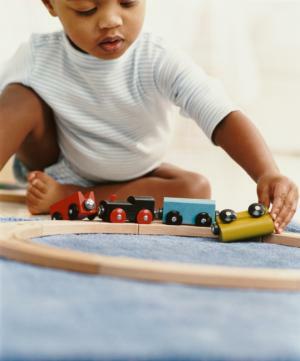 Begin with open-ended toys and materials that children can play with in a variety of ways: different sized boxes, animal figures, pillows, blocks, containers, etc. 3. Think ahead of the kinds of things that WOW your child: noise, sillies, mess. Make play fun not work to keep out of trouble. 4. Watch silently, smile and notice your child’s play but don’t interrupt with praise or helpful suggestions. Play means no approval necessary. 5. Add your comments or ideas during natural gaps in play, at least until your child’s independent resourcefulness is in full bloom. Add additional toys or unusual props to introduce novelty to the situation. 6. Resist the urge to solve your child’s problems. Give your child a few minutes to figure out his own solution. Feel free to ask open-ended questions: what can you do to fix that? what else do you need to make it work? Finally, if your child is used to you being a tireless and devoted source of entertainment, start slow. Remember it can takes weeks to change old habits. Start with 10 minutes of play and build up from there. Stay close until your child realizes she doesn’t need you. Your child will discover an ever-present best friend within himself.